Political economy is the study of production and trade and their relations with law, custom and government; and with the distribution of national income and wealth. As a discipline, political economy originated in moral philosophy, in the 18th century, to explore the administration of states’ wealth, with “political” signifying the Greek word polity and “economy” signifying the Greek word “okonomie” (household management). 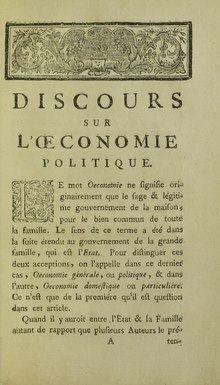 The earliest works of political economy are usually attributed to the British scholars Adam Smith, Thomas Malthus, and David Ricardo, although they were preceded by the work of the French physiocrats, such as François Quesnay (1694–1774) and Anne-Robert-Jacques Turgot (1727–1781). In the late 19th century, the term “economics” gradually began to replace the term “political economy” with the rise of mathematical modelling coinciding with the publication of an influential textbook by Alfred Marshall in 1890. Earlier, William Stanley Jevons, a proponent of mathematical methods applied to the subject, advocated economics for brevity and with the hope of the term becoming “the recognised name of a science”. Citation measurement metrics from Google Ngram Viewer indicate that use of the term “economics” began to overshadow “political economy” around roughly 1910, becoming the preferred term for the discipline by 1920. Today, the term “economics” usually refers to the narrow study of the economy absent other political and social considerations while the term “political economy” represents a distinct and competing approach. Political economy, where it is not used as a synonym for economics, may refer to very different things. From an academic standpoint, the term may reference Marxian economics, applied public choice approaches emanating from the Chicago school and the Virginia school. In common parlance, “political economy” may simply refer to the advice given by economists to the government or public on general economic policy or on specific economic proposals developed by political scientists. A rapidly growing mainstream literature from the 1970s has expanded beyond the model of economic policy in which planners maximize utility of a representative individual toward examining how political forces affect the choice of economic policies, especially as to distributional conflicts and political institutions. It is available as a stand-alone area of study in certain colleges and universities. Public choice theory is a microfoundations theory that is closely intertwined with political economy. Both approaches model voters, politicians and bureaucrats as behaving in mainly self-interested ways, in contrast to a view, ascribed to earlier mainstream economists, of government officials trying to maximize individual utilities from some kind of social welfare function. As such, economists and political scientists often associate political economy with approaches using rational-choice assumptions, especially in game theory and in examining phenomena beyond economics’ standard remit, such as government failure and complex decision making in which context the term “positive political economy” is common. Other “traditional” topics include analysis of such public policy issues as economic regulation, monopoly, rent-seeking, market protection, institutional corruption and distributional politics. Empirical analysis includes the influence of elections on the choice of economic policy, determinants and forecasting models of electoral outcomes, the political business cycles, central-bank independence and the politics of excessive deficits. A more recent focus has been on modeling economic policy and political institutions as to interactions between agents and economic and political institutions, including the seeming discrepancy of economic policy and economist’s recommendations through the lens of transaction costs. From the mid-1990s, the field has expanded, in part aided by new cross-national data sets that allow tests of hypotheses on comparative economic systems and institutions. Topics have included the breakup of nations, the origins and rate of change of political institutions in relation to economic growth, development, financial markets and regulation, backwardness, reform and transition economies, the role of culture, ethnicity and gender in explaining , macroeconomic policy, the environment, fairness and the relation of constitutions to economic policy, theoretical and empirical. New political economy which may treat economic ideologies as the phenomenon to explain, per the traditions of Marxian political economy. Thus, Charles S. Maier suggests that a political economy approach “interrogates economic doctrines to disclose their sociological and political premises…. in sum, [it] regards economic ideas and behavior not as frameworks for analysis, but as beliefs and actions that must themselves be explained”. This approach informs Andrew Gamble’s The Free Economy and the Strong State (Palgrave Macmillan, 1988), and Colin Hay’s The Political Economy of New Labour (Manchester University Press, 1999). It also informs much work published in New Political Economy, an international journal founded by Sheffield University scholars in 1996. Thomas Piketty‘s approach and call to action which advocated for the re-introduction of political consideration and political science knowledge more generally into the discipline of economics as a way of improving the robustness of the discipline and remedying its shortcomings, which had become clear following the 2008 financial crisis. In 2010, the only Department of Political Economy in the United Kingdom formally established at King’s College London. The rationale for this academic unit was that “the disciplines of Politics and Economics are inextricably linked”, and that it was “not possible to properly understand political processes without exploring the economic context in which politics operates”. In 2017, the Political Economy UK Group (abbreviated PolEconUK) was established as a research consortium in the field of political economy. It hosts an annual conference and counts among its member institutions Oxford, Cambridge, King’s College London and the London School of Economics. Sociology studies the effects of persons’ involvement in society as members of groups and how that changes their ability to function. Many sociologists start from a perspective of production-determining relation from Karl Marx. Marx’s theories on the subject of political economy are contained in his book Das Kapital. History documents change, often using it to argue political economy; some historical works take political economy as the narrative’s frame. Ecology deals with political economy because human activity has the greatest effect upon the environment, its central concern being the environment’s suitability for human activity. The ecological effects of economic activity spur research upon changing market economy incentives. Additionally and more recently, ecological theory has been used to examine economic systems as similar systems of interacting species (e.g., firms). ^ a b Alesina, Alberto F. (2007:3) “Political Economy,” NBER Reporter, pp. 1–5. Abstract-linked-footnotes version. ^ “What is Political Economy?”. Political Economy, Athabasca University. Retrieved 2017-06-15. • Brandt, Loren, and Thomas G. Rawski (2008). “Chinese economic reforms,” The New Palgrave Dictionary of Economics, 2nd Edition. Abstract. • Helsley, Robert W. (2008). “urban political economy,” The New Palgrave Dictionary of Economics, 2nd Edition. Abstract. • Gilpin, Robert (2001), Global Political Economy: Understanding the International Economic Order, Princeton. Description and ch. 1, ” The New Global Economic Order” link. • Mitra, Devashish (2008). “trade policy, political economy of,” The New Palgrave Dictionary of Economics, 2nd Edition. Abstract. ^ • Tullock, Gordon ( 2008). “public choice,” The New Palgrave Dictionary of Economics. Abstract. ^ Lohmann, Susanne (2008). “rational choice and political science,” The New Palgrave Dictionary of Economics, 2nd Edition. Abstract. ^ • Shubik, Martin (1981). “Game Theory Models and Methods in Political Economy,” in K. Arrow and M. Intriligator, ed., Handbook of Mathematical Economics, Elsevier, v. 1, pp. 285[dead link]-330. • Peter C. Ordeshook (1990). “The Emerging Discipline of Political Economy,” ch. 1 in Perspectives on Positive Political Economy, Cambridge, pp. 9–30. • _____ (1986). Game Theory and Political Theory, Cambridge. ^ Rose, N. L. (2001). “Regulation, Political Economy of,” International Encyclopedia of the Social & Behavioral Sciences, pp. 12967–12970. Abstract. ^ Krueger, Anne O. (1974). “The Political Economy of the Rent-Seeking Society,” American Economic Review, 64(3), p. 291–303. ^ • Bose, Niloy. “corruption and economic growth,” The New Palgrave Dictionary of Economics Online, 2nd Edition, 2010. Abstract. • Rose-Ackerman, Susan (2008). “bribery,” The New Palgrave Dictionary of Economics, 2nd Edition. Abstract. ^ • Becker, Gary S. (1983). “A Theory of Competition among Pressure Groups for Political Influence,” Quarterly Journal of Economics, 98(3), pp. 371–400. • Weingast, Barry R., Kenneth A. Shepsle, and Christopher Johnsen (1981). “The Political Economy of Benefits and Costs: A Neoclassical Approach to Distributive Politics,” Journal of Political Economy, 89(4), pp. 642–664. • Breyer, Friedrich (1994). “The Political Economy of Intergenerational Redistribution,” European Journal of Political Economy, 10(1), pp. 61–84. Abstract. • Williamson, Oliver E. (1995). “The Politics and Economics of Redistribution and Inefficiency,” Greek Economic Review, December, 17, pp. 115–136, reprinted in Williamson (1996), The Mechanisms of Governance, Oxford University Press, ch. 8, pp. 195–218. • Krusell, Per, and José-Víctor Ríos-Rull (1999). “On the Size of U.S. Government: Political Economy in the Neoclassical Growth Model,” American Economic Review, 89(5), pp. 1156-1181. ^ • Drazen, Allan (2008). “Political business cycles,” The New Palgrave Dictionary of Economics, 2nd Edition. Abstract. • Nordhaus, William D. (1989). “Alternative Approaches to the Political Business Cycle,” Brookings Papers on Economic Activity, (2), pp. 1-68. ^ • Buchanan, James M. (2008). “public debt,” The New Palgrave Dictionary of Economics, 2nd Edition. Abstract. • Alesina, Alberto, and Roberto Perotti (1995). “The Political Economy of Budget Deficits,” IMF Staff Papers, 42(1), pp. 1-31. • _____ and Torsten Persson (2008). “political institutions, economic approaches to,” The New Palgrave Dictionary of Economics, 2nd Edition. Abstract. • North, Douglass C. (1986). “The New Institutional Economics,” Journal of Institutional and Theoretical Economics, 142(1), pp. 230-237. • _____ (2010). “Beyond Markets and States: Polycentric Governance of Complex Economic Systems,” American Economic Review, 100(3), pp. 641-72 Archived 2013-11-05 at the Wayback Machine. ^ Beck, Thorsten et al. (2001). “New Tools in Comparative Political Economy: The Database of Political Institutions,” World Bank Economic Review,15(1), pp. 165-176. ^ Bolton, Patrick, and Gérard Roland (1997). “The Breakup of Nations: A Political Economy Analysis,” Quarterly Journal of Economics, 112(4), pp. 1057–1090. ^ Alesina, Alberto, and Roberto Perotti (1994). “The Political Economy of Growth: A Critical Survey of the Recent Literature,” World Bank Economic Review, 8(3), pp. 351–371. ^ Keefer, Philip (2004). “What Does Political Economy Tell Us about Economic Development and Vice Versa?” Annual Review of Political Science, 7, pp. 247–72. PDF. ^ Acemoglu, Daron, and James A. Robinson (2006). “Economic Backwardness in Political Perspective,” American Political Science Review, 100(1), pp. 115–131. ^ • Mukand, Sharun W. (2008). “policy reform, political economy of,” The New Palgrave Dictionary of Economics, 2nd Edition. Abstract. ^ • Roland, Gérard (2002), “The Political Economy of Transition,” Journal of Economic Perspectives, 16(1), pp. 29–50. • Barry, John 2001. “Justice, Nature and Political Economy,” Economy and Society, 30(3), pp. 381–394. Zajac, Edward E. (1996). Political Economy of Fairness, MIT Press Description and chapter-preview links. • Acemoglu, Daron (2003). “Why Not a Political Coase Theorem? Social Conflict, Commitment, and Politics,” Journal of Comparative Economics, 31(4), pp. 620–652. ^ cf: Baker, David (2006). “The political economy of fascism: Myth or reality, or myth and reality?” Archived 2011-06-23 at the Wayback Machine, New Political Economy, 11(2), pp. 227–250. ^ Cohen, Benjamin J. “The transatlantic divide: Why are American and British IPE so different?”, Review of International Political Economy, Vol. 14, No. 2, May 2007. ^ McCoy, Drew R. “The Elusive Republic: Political Economy in Jeffersonian America”, Chapel Hill, University of North Carolina. ^ Kennedy, David (2013). “Law and the Political Economy of the World” (PDF). Leiden Journal of International Law. Retrieved December 24, 2015. ^ “political economy”. Encyclopedia Britannica. Retrieved 2017-06-15. ^ May, Robert M.; Levin, Simon A.; Sugihara, George (February 21, 2008). “Ecology for bankers”. Nature. 451 (451): 893–895. doi:10.1038/451893a. PMID 18288170. Maggi, Giovanni, and Andrés Rodríguez-Clare (2007). “A Political-Economy Theory of Trade Agreements,” American Economic Review, 97(4), pp. 1374-1406. O’Hara, Phillip Anthony, ed. (1999). Encyclopedia of Political Economy, 2 v. Routledge. 2003 review links. Winch, Donald (1973). “The Emergence of Economics as a Science, 1750–1870.” In: The Fontana Economic History of Europe, Vol. 3. London: Collins/Fontana. “Aging and The Life Course: An Introduction to Social Gerontology / Edition 6.” Barnes & Noble, www.barnesandnoble.com/w/aging-and-the-life-course-jill-quadagno/1100262260. NBER (U.S.) “Political Economy” working-paper abstract links. VoxEU.org (Europe) “Politics and economics” article links.